What differentiates this new Sun Odyssey Series? 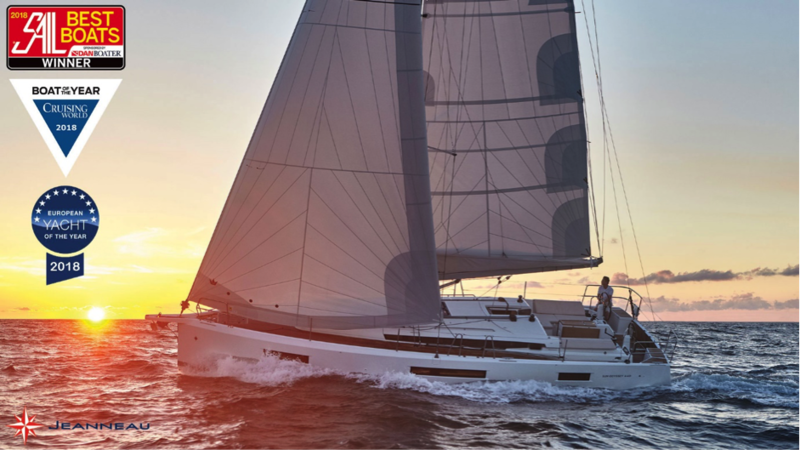 The latest 8th series of the iconic Jeanneau Sun Odyssey range was announced last year and to-date three models the Sun Odyssey 410, Sun Odyssey 440 and Sun Odyssey 490 have been released. 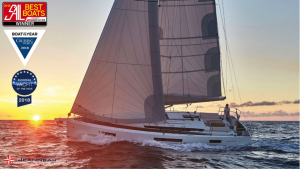 Hull design: Jeanneau are now leading the World with the very latest in hull design with more pronounced chines and that carry almost the full length of the hull. Developed from offshore racing designs this style of hull generates more stability, both directional and form to make these yachts even more balanced and stable. Hull construction: In the case of the SO490 Jeanneau have moved to another level by laminating the hull using the infusion technique and using a balsa core above the pan mould. This results in a lighter and stronger hull than previously seen and combined with its superb stability results in a very response and quick passage-maker. High stability: A combination of design factors results in yacht with an exceptionally lower centre of effort and this is clearly demonstrated in the stability STIX indexes. It would be very surprising if they aren’t the best in class. Twin rudders: With hulls of this volume twin rudders angled out become very effective in providing excellent grip at heel. This combined with the above offers even more directional stability making the yachts even more balanced across a wide range of conditions. Self-aligning rudder bearings: The introduction of self-aligning bearings ensures that no matter what the load is on the rudder the steering remains ultra-light. Cathedral rigs: The addition of an extra set of diagonal shrouds above the top spreaders combined with the wide rigging base allows the use of a smaller mast section than would otherwise be required which reduces the weight aloft which contributes further to stability. Integrated bow-sprits: Now standard are integrated bow-sprits which have strong points for both furling Code 0’s and also assymetric spinnakers, while the anchor will hold securely in place and is far enough away from the bow to make striking of the bow during raising and lowering unlikely. Retractable bow-thrusters: With this style of hull form tunnel type bow-thrusters would be ineffective, so a retractable unit is instead and option and this provide much better thrust being deeper in the water. Side deck walkways: A complete revolution in cruising yacht design this patented design has become possible because of the style of hull being used and remarkable does not impinge into the interior cabin space at all. The sloping side deck offers ease of movement, both at sea and ashore and is simply superb. It also results in the lifelines being very high as you exit the cockpit for additional safety at sea. Secure cockpits: Because of the sloping side-decks this allows the back-rests of the cockpit bench seats to be a proper supportive height since there is no need to step over them to access the side deck. So the seating is remarkably comfortable, and also adds protection to the cockpit from weather. In addition this also allows side screens to be fitted between the dodger and bimini to enclose the cockpit in inclement weather, while not impeding access to the side decks at all! Big swim platforms: All the models have large swim-platforms and have the option of electric control using a remote. So, as you approach your yacht on a mooring for instance you can use the remote to lower it ready for you to alight. How easy is that! Large central galleys: One noticeable difference in the new range is that the galley area is moved forward to the centre of the yacht and is wrap-around style, offering more counter space, greater security while at sea, and making it easier to serve to the saloon area. Rectangular regular shaped beds: Another major innovation possible due to the hull style is normal rectangular shaped beds that will take standard sheets and bedding, not just in the aft cabins, but also in the forward cabin, even on the new SO410! Large forward facing nav’ tables: All of these new models have returned to the popular full sized forward facing nav’ tables. Whether being used for navigation, for use of a lap-top or anything else this dedicated space continues to be an element that yacht buyers like. All level floors: The floors throughout the new range are all on one level with no door sills, making movement around the yacht easy and safe. Less companionway steps: These yachts all have less steps at a more gentle angle than the previous generation making movement between the cockpit and saloon easier and safer. Low hand-holds: Owners and crew no longer need to be of average height or more to reach hand-holds when moving around down below as all are now positioned down low, again for greater safety. Large hull windows: Carefully positioned to offer panoramic views outside while seated, either in the saloon or in cabins, and all cabins with aircraft style blinds for properly blocking out light for a better nights sleep. So, this new generation of Sun Odyssey yachts is a huge advance in design in every aspect with the sole purpose of making your yachting more enjoyable, both at sea and at anchor or mooring. Contact us today via email or call Bob Lushey on 0408 110 679.